If you want to stir up an interesting conversation among horsemen, bring up the barefoot versus shod question. Be forewarned—the discussion may get heated! Proponents of the barefoot side range from those who believe that many, if not most, horses will do just fine going barefoot to “all natural” equine advocates who disapprove of barns, blankets and grain feeding. On the shod side, farriers may line up with many sport horse fans to declare that most horses can be improved by shoeing. However, the reality is somewhere in between. Horses with good conformation and structurally sound hooves may do just fine all their lives with no shoes and being trimmed as needed. 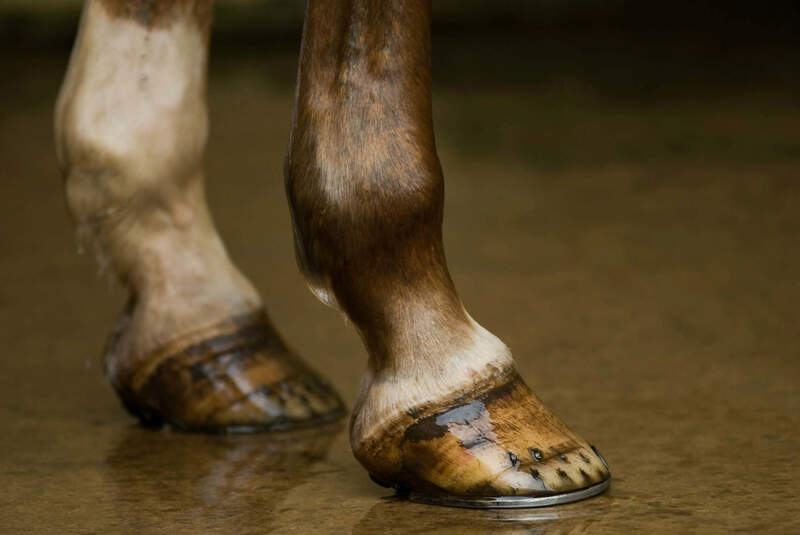 On the other hand, horses with less than ideal conformation, weak hoof structure or an involvement in equine sports will benefit from being shod. Some horses can perform soundly and happily while barefoot. For example, a number of Arabians participate in competitive and endurance rides without the benefit of shoes. These horses live and train barefoot to help toughen up the soles of their feet and encourage strong hoof walls. Can or should your horse go barefoot? Honestly assess his conformation. Look at his legs but also observe his hooves. Is he prone to sole abscess and bruises, even with shoes? Do his hoof walls tend to be brittle and crack or break off? If so, going barefoot may leave your horse sore or lame much of the time. Some horses’ feet will toughen up over time, but others will not. Consider the footing your horse will be on much of the time. If he lives in a grass pasture with natural springs, or if the ground is generally soft or wet, his hooves won’t toughen up enough to handle the work on hard, rocky areas. On the other hand, if he is only ridden lightly and within that pasture area, he may fare just fine barefoot. If you decide to try the barefoot method with your horse, allow from 30 to 90 days for the hoof to return to its natural state. During that time, your horse should be off work so that the hoof is minimally stressed. The use of boots if a horse is uncomfortable varies with the expert you consult. Some feel that boots simply extend the time for a horse’s hooves to adapt, while others feel that boots interfere with the toughening of the hooves. In years gone by, horses with poor hoof quality were eliminated from the gene pool. This occurred both by human and natural selection out on the range or other pastoral situations where horses ran free much of the time. Most horses today live fairly artificial lives, with small paddocks and stalls housing them. Healthy hoof growth depends on getting plenty of exercise, and some horses may not get enough exercise to stimulate regular hoof growth. In those cases, wear may exceed growth and those horses need shoes to be comfortable when ridden. Corrective shoeing can help horses with hoof ailments to continue a normal quality of life and work comfortably. The use of borium or pads can be a lifesaver for horses who are ridden in the winter or who simply need extra traction for the activities in which they participate. Horses who work on paved areas, such as police horses and working carriage horses, are much better off being shod. A horse with orthopedic injuries or abnormalities will often benefit greatly from being shod. Corrective shoeing is an art, and a good farrier can help horses with issues ranging from a sole bruise that is helped by a padded shoe or special angle work to pads to make a horse with conformational issues feel more comfortable. Remember that the work you ask of your horse may also influence a decision about shoeing or going barefoot. A horse being ridden cross country on a three-day event course may not only need shoes, but may perform much better with studs screwed in for the course. It’s difficult to make an adjustment like that on a barefoot horse! The bottom line on this debate? There is no one answer that is right for all horses. Each horse needs to be evaluated individually, with consideration given to his designated work and both leg and hoof conformation.